Three classic radio productions from the BBC archives starring Hannah Gordon, Tim Pigott-Smith, Paul Scofield and a host of celebrated acting talent. These three legendary plays, performed by some of the best-known theatrical actors of the 20th century, are the perfect way to commemorate England's greatest dramatist. The Winter's Tale: one man's consuming jealousy threatens to destroy both himself and those around him, but his actions arouse a passionate sense of honour, love, justice and self-sacrifice in members of his Court and family. First broadcast in 1982, starring Ronald Pickup as Leontes, with Hannah Gordon as Hermione and John Gielgud as Time. Pericles: Pericles is haunted by Fate, buffeted by storms, driven from country to country and cruelly separated from his wife and daughter. Having endured the waywardness of Fortune, will he be reunited with his family? First broadcast in 1981, starring Tim Pigott-Smith as Pericles and Angharad Rees as Marina. The Tempest: set on an enchanted island ruled by the sorcerer Prospero, this spellbinding tale of magic, illusion, forgiveness and repentance is one of Shakespeare's greatest plays. First broadcast in 1974, starring Paul Scofield as Prospero and Patrick Stewart as Caliban. 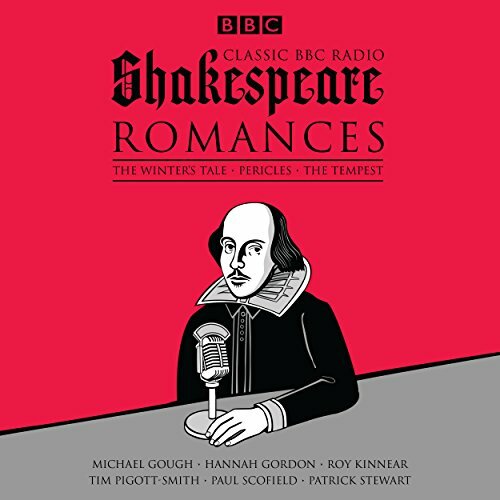 Recorded at BBC Broadcasting House and featuring the BBC Drama Repertory company, with specially composed music, this is classic radio drama at its finest.